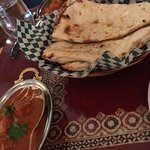 Chickpeas cooked with authentic indian herbs and spices served with basmati rice, roti or naan. 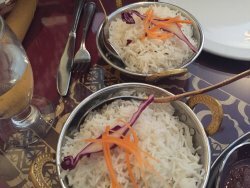 Basmati rice cooked with fresh vegetables and aromatic spices. 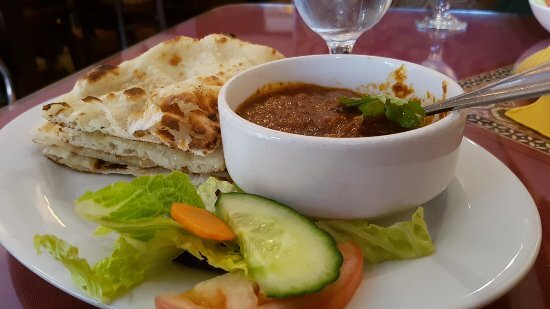 Consists of one vegetarian dish (chef ’s choice), your choice of chicken or beef curry, naan, basmati rice, a small green salad and your choice of raita (yogurt mixed with herbs) or kheer. Platter of garden fresh vegetable fritters made with special chickpea flour. 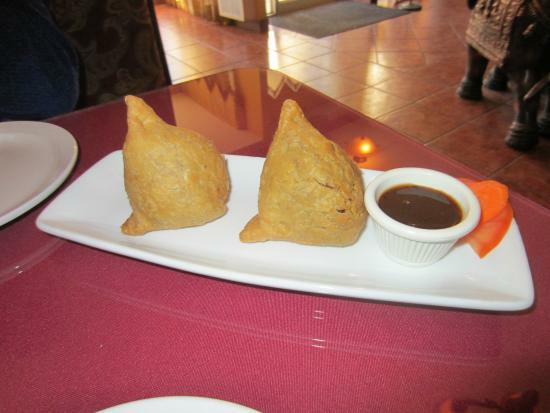 Served with tamarind chutney. .
Crispy pastry stuffed with potatoes and peas. Served with tamarind chutney. Crispy pastry stuffed with ground beef, spices and peas. Served with tamarind chutney. Boneless chicken marinated overnight in indian spices and aromatic herbs and yogurt, baked on skewers in tandoor. Served with mint chutney. Thinly sliced onions battered in chickpea flour, deep fried, served with tamarind chutney. Haddock marinated in indian herbs and spices and fried with chickpea flour batter. 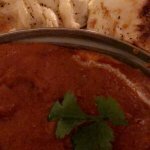 Tender pieces of boneless chicken marinated overnight in selected spices, cooked in clay oven and served in an aromatic tomato and cream-based sauce. .
Boneless chicken cooked in coconut cream based tomato sauce with south indian spices and herbs. 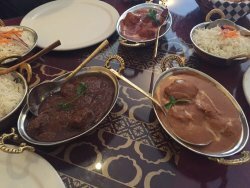 Boneless meat cooked in special thick sauce, prepared with fresh indian herbs and spices. Tender boneless meat cooked in clay oven served in thick gravy of specially selected fresh herbs, spices and a touch of yogurt with capsicum. A popular hot and sour goan style delicacy. Tender boneless meat cooked in fiery sauce with tender potatoes. Whole wheat deep fried indian bread. Deep fried indian flat bread. Unleven flour mixed with milk rolled into multi-layered bread with butter. 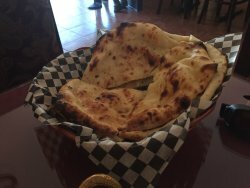 Naan stuffed with spicy onion masala. Soft tasty bread made with unleven our mixed with milk. Processed milk dumplings in cardamom flavored syrup garnished with nuts. Served hot or cold. Saffron flavored indian homemade ice cream enriched with nuts. 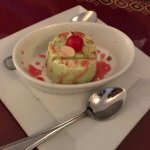 Traditional indian chilled rice pudding. Basmati rice cooked in sweetened milk, flavoured with almonds, cashews, pistachios and cardamoms. Saffron flavored homemade cheese dumplings served cold in sweetened syrup garnished with nuts. Paneer dumplings soaked in sweetened, thickened milk and delicately flavored with cardamom garnished with nuts. Cool refreshing yogurt drink with added spices. Salted or sweet. A refreshing indian style milkshake. Can't resist to their butter chicken, probably the best you can get considering the quality of the meat. 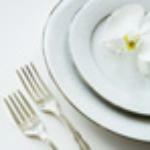 Prices are reasonable with courteous and rapid service. Staff are bilingual (English/French). Right on Main Street, it's easy to get there. 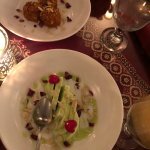 A must stop if you love Indian food! Went here directly from a 4 hour train trip to Moncton. Service was attentive and friendly. I ordered daal soup, rice, garlic roti, and vegetable pakoras. The food was delicious and the price was very reasonable. I would eat here again in a heartbeat. The spices and herbs are used to perfection. It's an adventure for your pallet especially if you enjoy exotic food. Never disappointing always fun. First time having Indian. Friend recommended. Restaurant was nice. Service was good. Food was quick to arrive and hot. My friend loves it and goes regularly. Get quick answers from Taj Mahal - Flavor Of India staff and past visitors.